This list of Frequently Asked Questions aims to provide answers to the most commonly asked questions regarding the Guide Lines on a national basis. Q: Why is Guide Lines going online? Guide Lines – Guide Lines remains name of the GGA policies and procedures manual. Electronic format – All policies and procedures for Guiding in Australia should be available and managed in an electronic (web-based) format. Full Transparency – There should be full transparency on all policies and procedures for Guiding in Australia, implying that no policies or procedures should be password protected on electronic documents. Q: Is there going to be a PDF version? A hard copy? No – The review found that whilst a hard copy is used by a lot of our volunteers, the hard copy presents big problems with regard to ensuring that we have consistent and current policy and procedures for Guiding across Australia. Q: Can we print out the information on the website? Yes of course – if you need to you can print out the web page or the forms that are on there. The Guidelines for Girl Guides website is being released to Girl Guiding across Australia and is in what we call “beta testing stage”. What this means is that we have gone through internal rounds of testing but now want to see how it goes with the members and volunteers. On each of the pages of the website you will see a “feedback button” (SNIP) If you want to provide feedback on the page, or the content in the page all you need to do is enter your thoughts/feedback here. (See image below of site with feedback button highlighted). The Guide Lines Guru is here to help you with your queries regarding the Guide Lines. Email the Guide Lines Guru your query and it will be forwarded to the most appropriate department to ensure that the response is accurate. As our Guide experts are volunteers, our response time cannot be based on a regular working week but we do hope to reply to you within 7 days. Thank you for your understanding. Please note that all State related queries need to be directed to your respective State office as we cannot provide advice on State related matters. Contact details for all State offices can be found here. 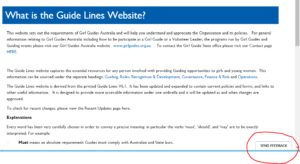 If your Guide Line question is not State related and you are unable to find the information you require by searching the Guide Lines website or in our FAQs please email your query to our Guide Lines Guru at guidelinesguru@girlguides.org.au.